"One of the best overviews of the very real dangers of MSG comes from Dr. Russell Blaylock, a board-certified neurosurgeon and author of “Excitotoxins: The Taste that Kills.” In it he explains that MSG is an excitotoxin, which means it overexcites your cells to the point of damage or death, causing brain damage to varying degrees -- and potentially even triggering or worsening learning disabilities, Alzheimer’s disease, Parkinson’s disease, Lou Gehrig’s disease and more. 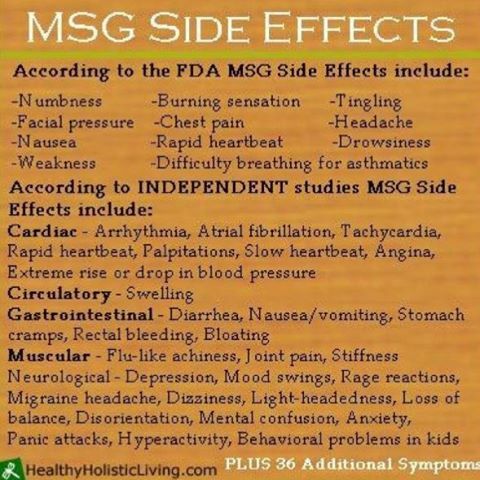 No one knows for sure just how many people may be “sensitive” to MSG, but studies from the 1970s suggested that 25 percent to 30 percent of the U.S. population was intolerant of MSG -- at levels then found in food. Since the use of MSG has expanded dramatically since that time, it’s been estimated that up to 40 percent of the population may be impacted." Truth in Labeling, one of our favorite websites as they tell it like it is too, had information that really helped explain the history and creation process very well.